MS SQL Server is commonly used by businesses for small-to-medium databases as well as for larger enterprise databases. It is absolutely necessary to monitor MS SQL Server 24x7 to ensure that your business-critical applications perform effectively. Proactive monitoring helps prevent downtime and quickly fix problems after they arise, but also to know the health of individual components and to identify potential problems and performance degradations before they turn into costly downtime. Detect MSSQL Server problems quickly and minimize downtime. Pin-point the exact point of failure to make sure MSSQL server is up and running quickly. Detect and correct potential performance degradations before they impact end users. Know the health of your MSSQL Server, inside out. OpManager's MSSQL database monitor counters include Data Files size, Log files Used Percentage, Active Transactions, Log growths, Log shrinks, Log files free size, Log Cache hit ratio, etc. Problems like increase in database size can be monitored by the 'Data Files Size' monitor, which shows cumulative size of all data files in the database including any automatic growth. Monitoring this counter is useful to determine the correct size of the databases. By proactively monitoring the databases and configuring thresholds, probable database size bottlenecks can be got ridden of. A growing number of users complaining that they have to wait for their transactions to complete is an indicator of trouble. Longer waiting time may mean that the object locking on the server might be contributing to this problem. 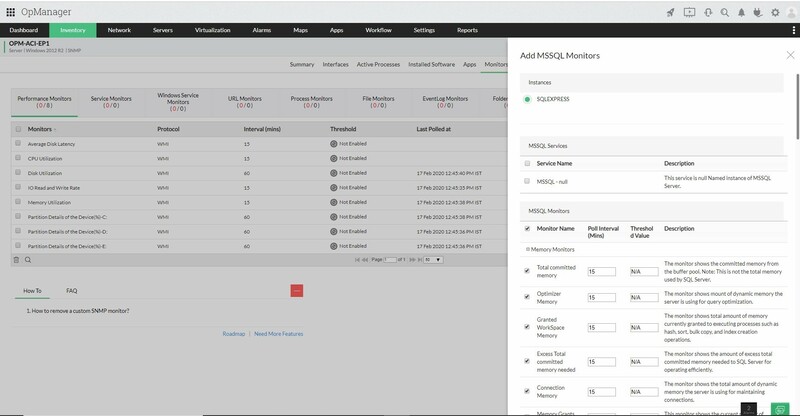 OpManager's MSSQL monitor's Lock-related monitors help in identifying the locks causing transaction delays so that you can investigate further and find out the cause. Other performance metrics monitored include buffer monitors, cache monitors, & memory monitors. Monitoring these critical metrics will help identify performance bottle-necks early on. OpManager's MSSQL Monitor does a good job in identifying this through setting up of thresholds & notifying you of the imminent failure. MSSQL Server depends for certain critical services for proper operation. The first step in ensuring MSSQL availability is to monitor these critical services. MSSQL Server that shows whether MSSQL Server is running or not. SQL Server Agent that shows SQL Server status. Microsoft Search that provides the Microsoft Search service status. SQL Server Browser service that shows SQL server browser service status. MSSQL Monitor offers an intuitive dashboard which gives you an overall picture of your MSSQL health at-a-glance. MSSQL Monitor includes more than 50 critical parameters that need to be monitored out-of-the-box. Also several monitors come with pre-configured thresholds set according to best practices recommended by Microsoft. You can start with these values and fine-tune it based on actual baseline values in your organization.